Use up the previous day’s pot roast or roast chicken. Save the gravy. Cut the pieces of meat into bite size pieces. 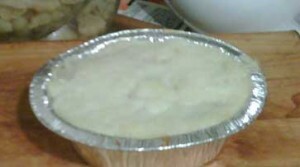 Place in the bottom of a casserole pan or individual meat pie tins. Place leftover corn/peas/corn or any mix thereof on top of the meat in a single layer OR frozen peas/corn and/or carrots – shredded raw carrot will also work for this – shred on a box grater. Spread mashed potatoes on top, enough to hide the other ingredients- these can be leftover mashed potatoes from the previous day, or cook up some potatoes and mash & cool spread on top … if in a pinch can also used instant box potatoes.. mashed & cooled, but be sure to add butter or becel and salt and pepper, so they don’t taste like they came from a box. Can also use biscuit topping – by making up some tea biscuit dough, rolling it out and placing on top Homemade English Tea Biscuit Recipe. Grated cheese on top is nice too. At this point – making sure all ingredients are cool and not warm or hot – cover. We use tinfoil for the individual pot pies – spray underside with PAM or non-stick cooking spray and label with a black marker right on the tin the contents ie: Beef Pot Roast Pie & either refrigerate, freeze or cook. At any rate, make sure they are HOT in the center and fully cooked prior to eating. Why make it more complicated, when it can be easy! 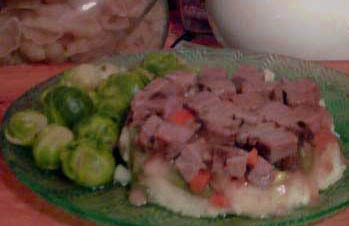 This works for almost any left over meat, including ground beef (shepherds pie) and leg of lamb as well. These are great for Christmas eve, or even just having in the freezer for a handy meal. Serve with PC Baby Brussels Sprouts on the side for an easy complete meal (as shown in picture).